The apartment is one of the few positioned inside the Pirin National Park, above the ski lifts, meaning there is no need to trudge uphill in ski boots to start the day. 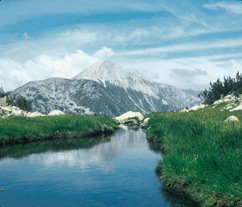 Bansko is the highest ski resort in Bulgaria, guaranteeing the best snow and ski conditions in the country. The Pirin mountain has a predominantly Alpine character with three peaks towering above 2900 m.
From family ski holidays in winter, to spring and summer breaks, our apartment comfortably sleeps 4, with a twin bedroom plus a 2 seater AND a 3 seater sofa bed. Contact us for a reservation and book your ski holiday in Bansko, or summer activity break today. We have made getting there as easy as possible by listing flight and transfer information to Bansko here on the website.